Born July 22, 1849 in New York, Emma Lazarus was the fourth child of the seven that have been Moses Lazarus and Esther Nathan, an American family of Portuguese origin living in New York since the colonial period. Originally the family had fled the Portuguese Inquisition. Formerly specializing in sugar refining, Emma was born into a relatively wealthy family in New York, she grew up in a stately home in Union Square. From her mother she is related to a judge of the Supreme Court of the United States, Benjamin N. Cardozo. Her Jewishness, of Sephardic origin, played a big role in her writing career, she has influenced in her policies and public action. Emma receives a rich and comprehensive education, she has a tutor that opens at the World Knowledge. She is particularly interested in writing. From an early age, Emma shows exceptional abilities in literature. 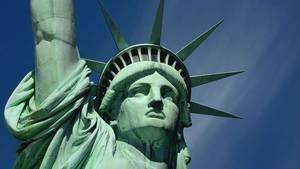 It takes a closer look at the US and British literature and learns several languages, including German, French and Italian. She began writing poems to be published by her father. This collection was noticed by Ralph Waldo Emerson who introduced the literary circles and became New Yorkers also her mentor. She published another volume of poetry, "Admetus and Other Poems" (1871) and a novel, "Alide: an episode from the life of Goethe" (1874) and a verse drama, "The Spagnoletto" (1876). After reading the novel "Daniel Deronda" by George Eliot (1876), a novel that explores Judaism in Victorian society, Emma Lazarus began to translate the medieval Hebrew poetry after the German Jews and some tests in favor a homeland in Palestine, this thirteen years before Theodor Herzl founded the Zionist movement. Her most important work is a book called "Songs of semite" composed poems on Jewish themes and lyrical dramas celebrating the Jewish courage and advocate the idea of ​​a Jewish nationality. She studied Hebrew and translated classical Hebrew poetry of the great literary figures of the golden age of Spain, including Judah Halevi and Solomin ibn Gabirol. Many of her translations were later incorporated into the books of standard prayers. Emma also works regularly in the Jewish press, in the weekly "American Hebrew". In 1880 she moved about the fate of Jewish emigrants to the United States and began to publish articles in the local press to support them, more strongly after 1881 and the arrival of Russian migrants in 1881 following the assassination Tsar Alexander II (Episode pogroms). It must be said that this murder preceded a wave of anti-Semitic violence, the Russian Jewish population tempting to take refuge in the United States. In 1882 she published Semitic books on the subject. Taking to heart her new role welcoming, she opened a refugee center for Jewish poor and helps the opening of the Hebrew Technical Institute of New York, which was tasked with providing vocational training for those not having no ability to work and offer them autonomy. On the island of Ward, she worked as an assistant for Jewish immigrants who had been arrested by immigration officers of Castle Garden. She was deeply moved by the plight of Russian Jews she met there and these experiences have influenced her writing. It must be said that these immigrants were very different from the Jews of the upper class of New York she used to rub. She was particularly surprised by the assimilated American Jews who seemed embarrassed by these Jewish refugees, at that time many American Jews did not want to be associated with these newcomers simply because they were afraid that these "different Jews" weaken their own social status, compromising their ability to assimilate into American culture. She continues in parallel her literary career published numerous poems. She also does translations of German poems, mostly those of Johann Wolfgang von Goethe and Heinrich Heine. She also wrote a novel and two plays in five acts. In 1883, with the pace of raising funds for the erection of the base of the Statue of Liberty, it shall, on the request of William Maxwell Evarts and the author Constance Cary Harrison, so she wrote a sonnet named "The New Colossus" and for the auction for the benefit of the exhibition "Loan Fund to the pedestal the Statue of Liberty by Bartholdi" ("Loan Fund Exhibition in Aid of the Bartholdi Pedestal Fund for the Statue of Liberty "). After being published in the New York World of Joseph Pulitzer and The New York Times, and have obtained great popularity, the sonnet slowly erased from the collective memory. It was not until 1901, 17 years after the death of Lazarus, that Georgina Theodora, one of her friends, finds a book containing this sonnet (in a bookstore!) And manages to revive the work once thought lost. 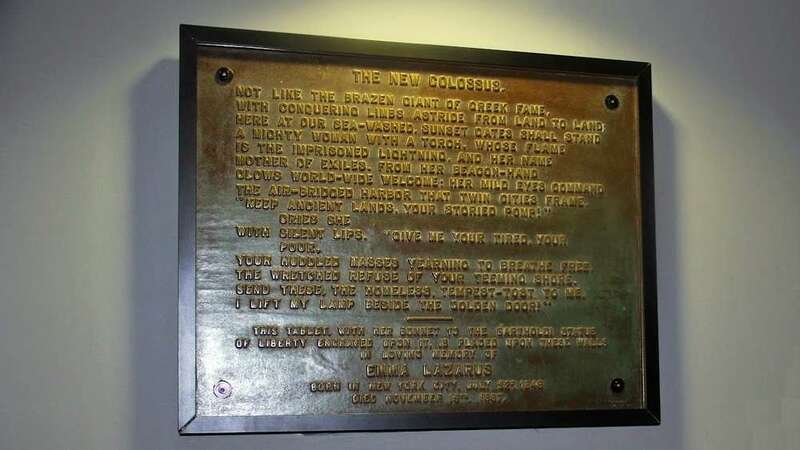 Her efforts bore fruit in 1903 with the creation of a large copper plate on which was engraved the sonnet, and the visitor can see a wall of the museum of the statue in the base itself. In 1883 she makes a first trip to Europe. In March 1885 her father died, and two months later, in May 1885, it makes a second trip, still in Europe (Italy, UK). She will reiterate such a trip in September 1887 that it will return strongly weakened. 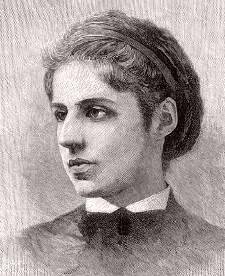 Emma Lazarus died two months later, on 19 November 1887 in New York, at the age of 38 years. She is buried in Beth-Olom Cemetery in Brooklyn. Emma Lazarus has been all her life an important precursor of the Zionist movement in the United States. She called for the creation of a Jewish homeland thirteen years before Herzl began to use the word "Zionism" well before it was popularized. She was honored by the Office of the President of the Borough of Manhattan in March 2008 and her house on 10th Street West is part of the circuit on the history of women's rights and historic sites. In 2012 the Museum of Jewish Heritage features at a special exhibition. She was also one of the first admirers of Henry George. Emma Lazarus has a memorial in New York, it is a Battery Park, just south of Manhattan. 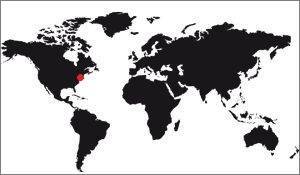 Its exact address is Neighbourhood Financial District, NY, US, United States. 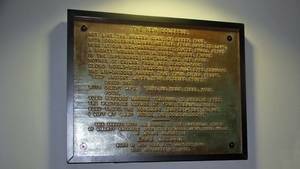 It is a bronze plaque dating from 1955 donated to the town by the Organization of Jewish Women of Federations. Here is the poem in its original language, English. Its french translation and explanations of the poem are on a dedicated page. Here are some of Emma Lazarus poem, quite prolific author. Saying, "Ho, all who weary, enter here! Grim bulwarked hatred between heart and heart!" Who grasps the substance? who 'mid shadows strays? Have cushioned al her couch with soft brown sprays? To read the ancient wonders and the signs. And open unseen gates with key of gold? Floats the horned, yellow moon. The slow, sure, sacred dawn. The glimmering low east streaks. As the mirk curtain breaks. Like phantoms melt and pass. Wet furrows, flowers, and grass. Of yon hill crowned with woods. Dart, poise, and flash along. Her faith in dawn was lost. Toward the pure source of day. To light her godlike way. World above world, and heaven over heaven. High in the tower, an earthly star of even. For yon tired watcher in the gray old tower. Falls this unwonted peace on heart and sense. And sweeter than the birds? And the rich rose of love. Not less illustrious, who are living yet? As in the camp and field. Of the dear fellow-martyrs they survive? O brothers, ye may weep! Wide haughty rivers, and pale, English skies. Of knightly deeds and dreams. And devout as St. Ignatius. Who forswore the world to rear him. For her richer crown of fruitage. And upon her boy Pedrillo. Buying masses for the needy. Nor the wretched Jew despising. Offering to her tribe her bounty. Of the zealous youth Pedrillo. Who pollute the soil of Spaniards. Golden-green with streaks of scarlet. No hot flush o'erspread her features. And a shadow crossed her forehead. Teaching to the fowls of heaven. 'What care I for curse of Talmud? Of the murderers of our Saviour. 'Think you words like these will touch me? On my deeds will smile in blessing. Love him were he thrice a Christian. And a stench unto my nostrils. With bowed head sought Donna Clara. 'O World-God, give me Wealth!' the Egyptian cried. Of lavish Nile washed all her land with gold. Set death at naught in rock-ribbed charnels deep. Rust and the moth, silence and dusty sleep. 'O World-God, give me beauty!' cried the Greek. Peopled the world with imaged grace and light. Of diamond-pointed thought and golden tongue. A broken column and a lute unstrung. 'O World-God, give me Power!' the Roman cried. A captive to the chariot of her pride. To feed that fierce, insatiable red heart. The imperial race of everlasting Rome. 'O Godhead, give me Truth!' the Hebrew cried. Cursed, hated, spurned, and scourged with none to save. His wisdom wore the hoary crown of Eld. Beauty he hath forsworn, and wealth and power. Seek him to-day, and find in every land. Immortal through the lamp within her hand. Soar none except the eagle and the lark. And I force the gates of death. I can lift her up to me. And embraces me once more. To my soul her soul replies. And I shiver lone and cold. Yet all day a ghost am I.
Nerves unstrung, spent will, dull brain. And she claims me hers again. Would I had waked this morn where Florence smile! The Burst-of-Spring, the Avenging Rod. Spoken by a Citizen of Malta-1300. On my lord Bishop's head, her grace of Malta. Or ere they kneel to kiss the large white hand. Whose void chair shall be taken, but not filled. Haply, what this Red Disk may be, he guards. Branded beneath the beard of every Jew. From the degrading contact Christian folk. Christ's blood! it sets my flesh a-creep to think! The scarlet stamp of separateness, of shame. May hide that damning little wafer-flame. Whether or not the hated spot be spied. Guarding the Red Disk-lest one rogue escape! Half their sky off with its ridge. To their music as they fare. In their midst a white unruffled swan appear. White its tasseled, silver prow. Clad in glittering silken snow? Where the hollow rings have place. Seem to fly him, he seems ever to pursue. 'T is our sport to watch the race. Like Salome at the King's. Hers to flee him, to elude him in the game. Ah, she fears him overmuch! In her horror of her touch. But the whirl of fate and chance. There the mystic gondolier hath won her bride. Hark, one helpless, stifled scream! Mimes and minstrels, flowers and music, where are ye? Was all Venice such a dream?